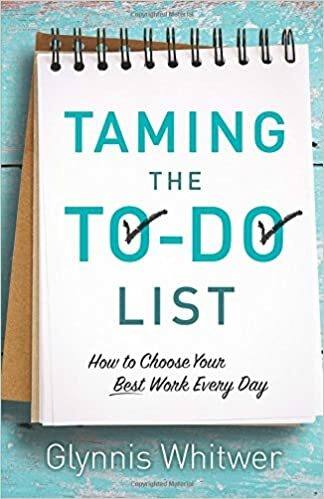 The first book I read through was Taming the To-Do List – How to Choose Your Best Work Every Day by Glynnis Whitwer. It’s a good one, and seemed to speak right at my Word for 2018 – Know. Life was still feeling pretty hectic after the move, we still seemed to be reeling from it, and as I looked to the months ahead I had no idea what I could realistically fit into my days on top of just the basics. And I wasn’t OK with that. I wanted more, do more, see more, connect more – to the people and places of our new city. Yet whenever I tried to plan and book and arrange life to meet the goal of more something would come up – something normal like illness or household repair or car accident or bad weather. And I felt like I was being held back from all the things I’d looked forward to before the move. Then I remembered – Simply Live… because every moment is full of possibility. It always comes back to this for me. If you’ve ever been in that crazy-busy place, you know the most urgent issues, the ones that fill your day, aren’t always the most important ones. And if you’ve become chronically chaotic, you might not even know what your priorities are anymore. Chronically chaotic – yes, I get this. Whatever is loudest, whoever is loudest – they scream for attention and usually end up getting it. Because it becomes very hard to hear anything else. What are the quiet, most important needs? What are the things that keep hanging on at the bottom of the list, grabbing for dear life, hoping they’ll get noticed tomorrow, or the next day, or the next? The dreams of my heart speak in a whisper, not a roar. Especially when I press them down over and over. What am I pushing down? What are the dreams of my heart? Will I still recognize them as mine if I try to look? My reality may include cluttered and chaotic circumstances, but it also includes the Spirit of God and the mind of Christ. The natural mind hears the shouts of the urgent. The mind of Christ allows me to hear the whisper of God in the midst of it all. So I ask God. I listen for the whispers. Knowing He’s going to help me hear them. I think it often calls for a little solitude. And this can be found anywhere, even in the middle of a busy crowd, if you realize solitude happens within. Taking a moment, the possibility in the moment, listening for God’s whispers even as you’re talking with others or completing a task. Some of my best talks with God happen when I’m cleaning around the house. It’s been this way for years. I’ve come to realize I like to contribute to the household finances. For me this means saving lots of money whenever I can on whatever I can. Unless it adds to the chaos – then I try to let it go and pay what’s needed to keep things simple. It also means managing our rental property and publishing books and family resources to sell on Amazon and Etsy. I love to give back – whether it’s with time or prayer or finances. Through the years it’s looked like volunteering at school, church, and summer camps, inviting tons of people of all ages and stages into our home, fundraising for different organizations, local and global mission trips, and praying for others as needed. It has also looked like writing encouraging letters, giving someone a hug or a few minutes of conversation, or even just smiling at the kindred quiet spirit in the corner of the room. It’s whatever I have to give that year, month, week, day, minute. It’s often very different. The trick is not to beat myself up when there’s less to give, when I’m already emptied out, when all I can hear are the shouts instead of the whispers. And that brings me to – enjoying my family and nature. Yes please 🙂 For me this looks like walks, hikes, bike rides, looking out the window, etc. It means that making dinner is actually important and it’s OK if I focus on healthy meals for my family. It means family get-togethers and outings and vacations are actually a priority. And it’s good to be available and fully present for random conversations and unplanned adventures. The challenge comes for me in prioritizing the things that are solely for my enjoyment. When continuing to enjoy my family means I need a break for a little while. Or when noone else wants to venture into nature with me or stop for a few minutes to look out the window (what I really mean is just slowing down for a few minutes and looking around at whatever there is to experience). That’s when it gets tricky. Where does all this take me? Now that I’ve listened at least a little and heard at least a few whispers of the heart… what now? Where to start? Because even the simple things can seem a tad overwhelming on the hard days. And Know–ing can fly out the window sometimes. When setting a plan for the day or week, add a few small tasks to your list. Then when a little window of time opens up, you can quickly check one more item off your list. Did the servant not value his one talent? Did he think it insignificant compared to what the other servants received? The Lord values what seems meager to others. Every effort we make, every small step we take, if it is done with a right heart, pleases God. Zechariah 4:10 says, “Do not despise these small beginnings, for the Lord rejoices to see the work begin” (NLT). Perhaps the wisest thing we can do is to learn to value our minutes. The greatest accomplishment on earth started with someone working for just sixty seconds. By Know–ing that my hopes and dreams are important to God. That He sees my efforts. That He’s pleased even with one talent if I use it to His glory. Making dinner is a talent. Household finances is a talent. Keeping my body healthy by exercising is a talent. Encouraging others is a talent. Being there for my family is a talent. The shouts of the world have caused me to compare myself to others many times over – those with lives much busier and what seems much more peaceful than mine. Lives full of accomplishments I’ll never attain, gifts and abilities I’ll never have, and luxuries I’ll never own. The whispers of my heart – the gentle and personal and convicting and intimate voice of God that speaks right into my soul – says I love you just the way you are. I love the way you’ve grown. I love how you will still grow. One talent at a time, one day at a time, one whisper at a time. Together. Such quiet confidence in that. Feels great to begin to Know.